Java, known as Jawa in Indonesian, is a large island centrally located in the Indonesian archipelago. It is over 1000km long and has with 130 million inhabitants a high population density. Java is almost entirely of volcanic origin and is crossed by a chain of mountains extending from east to west. Many volcanoes in Java are still active and the highest one is Gunung Semeru (3676m). Due to the fertility of the soil Java is intensively cultivated and up to four harvests per year are possible. The Srivijaya kingdom flourished over most of Java between the 7th and 13th centuries and was followed by the Majapahit empire. 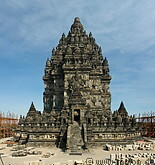 In the 13th century Islam started spreading in Indonesia and became the dominant religion in Java by the end of the 16th century. European colonisation of Java started with the arrival of the Dutch in the 17th century. Java became independent in 1945 as part of the republic of Indonesia. The capital of Indonesia, Jakarta, is located in western Java.